Until the late 19th century, most dinnerware in the US was imported. However, in the 1870s and 1880s, several American potters began to make white "granite ware." Several potteries were situated in New Jersey, including City Pottery in Trenton, other potteries were also established near East Liverpool, Ohio, including Knowles, Taylor & Knowles and Homer Laughlin & Co. 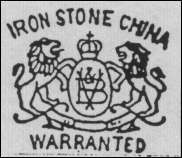 Most of the ironstone produced in the US had simpler shapes than the English imports which were still preferred by Americans. 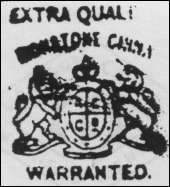 In an attempt to sell more of their wares, most American potteries did not mark their wares, and some used marks that resembled the British Royal Arms. 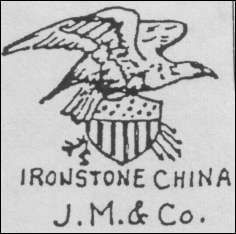 As people became more confident in purchasing American made ware there was a transition from the British Royal Arms to the use of the American Eagle - below are examples of the Royal Arms and also the American Eagle form the same potter - John Moses. 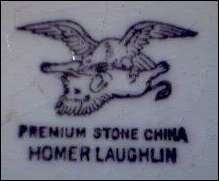 Homer Laughlin & Co even used a mark which depicted the American Eagle attacking the English Lion. 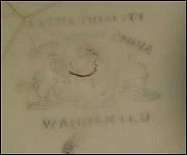 see Ott & Brewer's use of the name "ETRURIA WORKS"
Use of the full British Royal Coat of Arms with the Lion, Unicorn, Shield and both mottos. 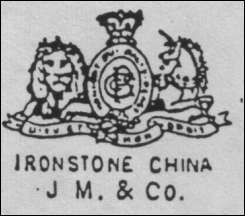 Use of part of British Royal Coat of Arms with the Lion, Unicorn, but with letters in the Shield and no mottos. 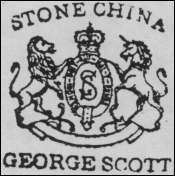 Use of part of British Royal Coat of Arms with the Lion, Unicorn, but with letters "GS" in the Shield and only one motto. 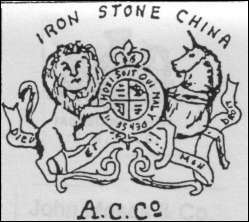 Use of part of British Royal Coat of Arms with the Lion, Unicorn, but with letters "JC" in the Shield but both mottos. Use of part of British Royal Coat of Arms with the Lion, Unicorn, but with letters "V&B" in the Shield and no mottos. 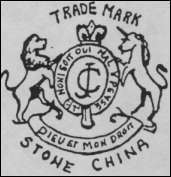 Use of part of British Royal Coat of Arms with the Lion, Unicorn, but with letters in the Shield but both mottos. 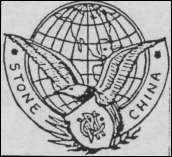 Mark showing the "American Eagle" attacking the "British Lion"